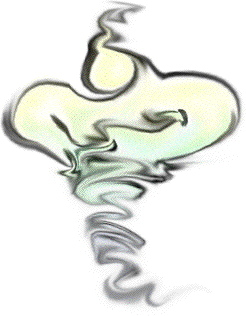 This is a picture of a genie that I did in Fractal Design Painter. It's kind of swirly and twisty like a tornado. This is just a sketchy picture of a guy wearing a hat, again done with Painter. This is one of my favorites. I took a llama picture and just painted on top of it in Ultra Paint. Llama Man fights for truth, justice, and the well being of all llamas.